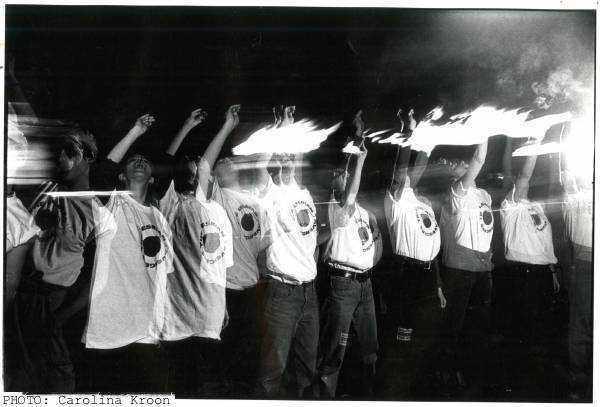 Founded in 1992, the Lesbian Avengers were a direct action group focused on lesbian visibility and survival. Too impatient for lobbying or letter-writing, these fire-eating secretaries, students, cab drivers, journalists, artists and teachers joined together to create fabulous street actions that inserted lesbians into public life, forced political change, and redefined dykes as the coolest, most ferocious, girls on the block. The Lesbian Avengers' Civil Rights Organizing Project (LACROP) went even further, taking a group of out lesbians where they'd never been before  into the heart of heartland politics. Media was often key. Placing a photo in the newspaper, or appearing for ten seconds on the news was half the battle in getting visibility for lesbians and lesbian issues. The Lesbian Avengers shaped their actions for visual impact, and had media committees dedicated to outreach and "propaganda." The Lesbian Avenger Handbook offered a step by step guide on how to attract press attention from mainstream and lesbian and gay media, even including examples of press releases. But not all their media efforts were directed outward. While the Lesbian Avengers focused on becoming visible in society and negating stereotypical images of lesbians, they worked just as hard to change the way lesbians saw themselves. Their communiqué-style newsletters gave activism the cachet of cool. "Look how much we're getting done, and how much fun we're having while we do it." Lesbian Avenger parties not only raised money, but exploded the images of lesbians as sexless wallflowers, closeted pervs, or victims. Party flyers featured icons like blaxploitation star Pam Grier with a rifle, or subverted the smiling image of aproned housewives by giving them a bomb on platter instead of a cake. The Lesbian Avengers made a difference. When Colorado passed the anti-gay Amendent Two, the Lesbian Avengers were among the first activists to demand its repeal, supporting the effort of the Boycott Colorado campaign with zaps against the Denver Mayor in New York. Later on, homegrown Colorado Avengers picked up the trouble-making torch, contributing towards the Amendment's eventual defeat. A joint action in Tampa after a dyke's home was firebombed led to a statement from the local mayor denouncing it as a hate crime. None of the twenty thousand dykes at the Dyke March in Washington, D.C. in April of '93 will forget the power. And LACROP swung the vote defeating an anti-gay referendum in Idaho. Altogether, sixty Lesbian Avenger chapters worldwide mobilized an untold number of lesbians. We're still discovering their impact. Video: Lesbian Avengers Eat Fire Too. Editors, Janet Baus, Su Friedrich. (1993). Cogswell, Kelly. Eating Fire: My Life as a Lesbian Avenger. University of Minnesota Press, 2014. Salholz, Eloise. The Power and the Pride, Newsweek, 1993-06-21. Pursley, Sara. "Gay Politics in the Heartland: With the Lesbian Avengers in Idaho." The Nation 260 (January 23, 1995) pp 90-94. Download pdf. Myers, Steven Lee. IDEAS & TRENDS; How a 'Rainbow Curriculum' Turned Into Fighting Words. New York Times, 1992-12-13. SUNDAY, APRIL 24, 1994; Fire-Eating Lesbians New York Times Magazine, 1994-04-24. Atkins, Robert. Girls With Wheatpaste And Webspace. Offers insight into two of the Avengers' image makers. With 60+ chapters worldwide, there was probably an Avengers group near you, so get involved. Make history!